SINCE THE BEGINNING of history, human beings have explored the Earth. 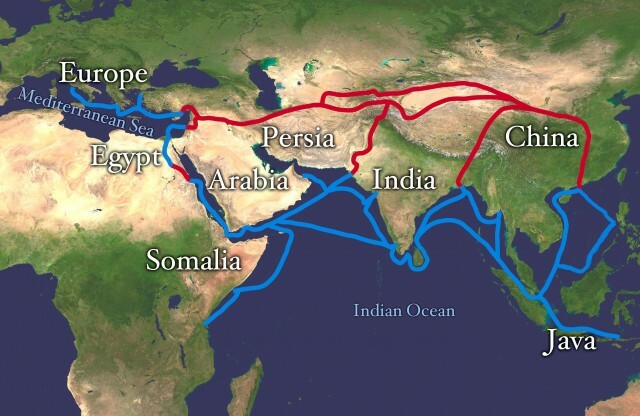 With the creation of empires, the explorations were often connected to great expeditions made to conquer new territories or to open new commercial roads. The ancient empires and their explorations include the following. EGYPT appeared as a unified state around 3300 B.C.E. About 3100 B.C.E., Egypt was united under Menes, who inaugurated the 30 pharaonic dynasties in which Egypt ancient history is divided: the Old and the Middle Kingdoms and the New Empire. The Egyptians reached Crete around 2000 B.C.E. and were invaded by Indo-Europeans and Hyksos Semites. They defeated the invaders around 1570 B.C.E. and expanded into the AEGEAN SEA, SUDAN, LIBYA, and much of Southwest Asia, as far as the Euphrates River. It survived as an independent state until about 300 B.C.E. Sumerians lived in the southern part of Mesopotamia from the time of settlement until the time of Babylonia. The Sumerians inhabited various citystates, each built around a temple dedicated to the god of the city and ruled over by a king, who was tied to the city’s religious rites. Discoveries of obsidian from places in Anatolia (modern TURKEY) and AFGHANISTAN, pearls from Dilmun (now BAHRAIN), and many seals inscribed with the Indus Valley script, suggest a considerable wide-ranging network of ancient trade around the PERSIAN GULF. The Epic of Gilgamesh refers to trade with far lands for goods such as wood that were scarced in Mesopotamia. In particular, cedar from LEBANON was appreciated. Assyria, a country on the Tigris River, was in the beginning a colony of Babylonia and was ruled by viceroys from that kingdom, founded in 1700 B.C.E. In 1120 B.C.E., Tiglath-Pileser I, the greatest of the Assyrian kings and founder of the first Assyrian Empire, crossed the Euphrates, defeated the kings of the Hittites, conquered Carchemish and advanced on the coasts of the MEDITERRANEAN SEA. In 745 B.C.E., Pul, who assumed the name of Tiglath-Pileser III, directed his armies into SYRIA and took it in 740 B.C.E. Azariah was an ally of the king of Hamath, and thus was obliged by Tiglath-Pileser III to pay him homage and give a yearly tribute. In 738 B.C.E., in the reign of Menahem, king of Israel, Tiglath-Pileser III invaded Israel. The king Assurbanipal entered on a conquering career and, having absorbed Babylon, the kingdoms of Hamath, Damascus, and Samaria, conquered Phoenicia and made Judea feudatory, and subjugated Philistia and Idumea. Phoenicia was an ancient civilization with its heartland along the coastal plain of what is now Lebanon and Syria. Phoenician civilization was an enterprising maritime trading culture that spread right across the Mediterranean during the 1st century B.C.E. Phoenicians founded independent city-states like Byblos, Tyre, Tripolis, and Berytus, as well as others on the islands and along other coasts of the Mediterranean Sea. This league of ports was then ideally suited for trade between the Levant area rich in natural resources and the rest of the ancient world. Byblos soon became the main center from where they proceeded to dominate the Mediterranean and Erythraean sea routes. Byblos was attacked by invaders, and by around 1000 B.C.E. Tyre and Sidon had taken its place. In the centuries after 1200 B.C.E., the Phoenicians formed the major naval and trading power of the region. The Phoenicians established commercial outposts throughout the Mediterranean, the most notable being Carthage in North Africa, with others in CYPRUS, Sicily, Corsica, Sardinia, SPAIN, and elsewhere. The Lebanese, Maltese and some Somalians still consider themselves descendants of Phoenicians. Their ships ventured out into the ATLANTIC OCEAN as far as Britain, where the tin mines in modern Cornwall provided them with important material. They also sailed south along the coast of Africa. A Carthaginian expedition led by Hanno the Navigator explored and colonized the Atlantic coast of Africa as far as the Gulf of Guinea, and a Phoenician expedition sent out by Pharaoh Necho II of Egypt even circumnavigated Africa. Greece is a region on the south of the European continent. It is defined by mountains, surrounded on all sides except the north by the sea, and endowed with large and small islands. The Ionian and AEGEAN SEAs and the many bays allowed the Greeks to prosper in maritime commerce and to develop a culture that was inspired from many sources, both foreign and local. The Greek world spread far beyond Greece itself, including many settlements around the Mediterranean and BLACK SEAs. The mountains, which served as natural obstacles and boundaries, imposed the political character of Greece. From early times the Greeks lived in independent communities isolated from one another by the landscape. Later these communities were organized into CITY-STATES. The mountains prevented large-scale farming and prevented the Greeks to look beyond their borders to new lands where fertile soil was more abundant. The Greeks started to sail the seas to conduct commerce since very ancient times and reached the Pillars of Hercules, but the great movement of expansion of Greek people was between the 8th and 7th centuries B.C.E., enlarging geographical knowledge. These travels that prepared the Greek colonization of Mediterranean area were true explorations. The result was important for the knowledge of the entire Mediterranean Sea and Black Sea and the surrounding area, into the internal mountains of Asia and eastern Africa. The expansion of Alexander the Great’s kingdom started in 336 B.C.E., when he succeeded his father to the throne of Macedonia. After that, Alexander began a military expedition with the intention of conquering the Persian territory in Asia Minor and set Egypt free, becoming the emperor of a new huge realm. At its greatest extent, this empire covered over 3,000 mi (4,828 km) from Greece to INDIA, enclosing Egypt and Persia, up to the river Indo. The capital of this dominion was Alexandria in Egypt, founded about 331 B.C.E. During army marches, country by country, several teams of geographers, botanists, and other men of science collected information and specimens for Aristotle, the mentor of Alexander. While a historian kept records of the march, cartographers made maps that served as the basis for the geography of Asia for centuries. (sailed for the first time by the fleet of Nearco from the Indo to the Euphrates). The power of Rome (founded in 754 B.C.E.) started with its expansion in Italy and in Europe and finally in the Mediterranean area and farther. After the kingdom and the republic, the Roman Empire started with Augustus in 27 B.C.E. The greatest expansion was during the reign of Trajan (98–117), when he conquered Dacia. In this age, the Roman Empire extended from Spain to the West Pontus and North Arabia to the east, from Britannia to the north, and to the North African coasts in the south. Constantine transferred the capital of the empire in Byzantium, and his heirs divided the empire into two parts. The empire died in its occidental form in 476, when Odoacre deposed the last emperor and transferred the power in Constantinople. The eastern half of the empire remained the heartland of the Roman state until 1453, when the Byzantine Empire fell to the Ottoman Turks. The administration of the Roman Empire was divided in provinces. The number and size of provinces changed according to internal Roman politics. Under the Roman republic, the governor of a province was appointed for a period of one year. At the beginning of the year, the provinces were distributed to future governors by lots or direct appointment. During the empire, the biggest or more garrisoned provinces were subdivided into smaller provinces in order to prevent a situation where a unique governor held too much power, thus discouraging ambition for the imperial throne itself. With the formation of the principate after the civil wars ended the Roman republican period, Augustus retained the power to choose governors for the provinces in which he and his successors held supreme military and administrative control. Thus, the more strategically critical provinces, generally located along the contested borders of the empire, became imperial provinces. The remaining provinces were maintained as senatorial provinces, in which the senate had the right to appoint a governor. During the empire of Diocletian, the diocese was created, a large administrative unit made up of up to 16 provinces. The empire was separated into 12 (or later, 15) dioceses. Each diocese was governed by a praetor vicarius who was subject to the prefect. Everywhere the Roman Empire extended, great architectural structures were built. A great road network connected the entire Roman Empire, facilitating trade and exploration. 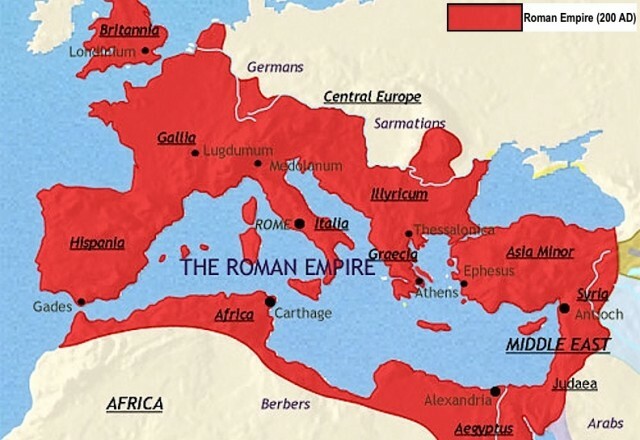 From the second half of the 2nd century B.C.E., until the first century, the military campaigns that consolidated the Roman Empire helped the progress of geographic knowledge. The Greeks, as a mainly seafaring people, explored the coastlands; thanks to the Romans, knowledge of the inside lands also became known. The Alpine regions of the Gallia, the interior of Iberia, and Britain and Germany were finally explored. North African lands were explored, from Ethiopia and the Nile Valley beyond the confluence of the two principal branches (during the empire of Nero), to Libya, where military expeditions scouted the middle of the SAHARA DESERT and the ATLAS MOUNTAINS in MOROCCO. In Asia, the mountainous regions of ARMENIA, Arabia, and the lands beyond the Pontus were explored. The knowledge about the Torrid Zone of the world was revised with the discovery of the existence of Ethiopic people living beyond the African desert. The existence of nomad people living in northern Europe, where Romans thought lived the fabulous Iperboreans, was also proved.